Jam Party People • :: View topic - 'Rock Dust Light Star' U.S. Release April 2012!! 'Rock Dust Light Star' U.S. Release April 2012!! I know, some of us are grimacing at the horrendous artwork, but hopefully the booklet artwork will make up for this shortcoming. Massive thanks to Dye & Diamond_Doc on JamiroTalk.net for finding out all this info for this release and Cheers! Re: 'Rock Dust Light Star' U.S. Release April 2012!! no f*cking way! Really? I am speechless! It;s about f*cking time. Really! I think Jamiroquai should be in green, the buffaloman should be in purple, and the walkway should be in yellow for "the Yellow brick road"! I'd really like "Smile" as a bonus on this! btw thank you JamiroFan2000 for the update! Please keep us up, especially if you hear of any possible tour. You finally going down, suckers!!! That is one horrific cover! caroli wrote: That is one horrific cover! Hey .......it is being released on my birthday!!!! The cover's not that bad - at least it's better than the original! now the next thing is, will they finally tour north america? no, Jamiroquai in purple, and the walkway in green. Keep the golden buffaloman! Purple skies and green grass! Oh hell, I don't care, I'll just be waiting to hear it on my radio! What song first? hmm...Hurtin? White Knuckle Ride? She's a Fast Persuader? I'd love Smoke & Mirrors. This isn't some hoke? April Fools' Day joke? Your very welcome, I would think with Jamiroquai touring Japan in August, if RDLS does good sales numbers in the states that they should at least do a few big city tourdates in the states, maybe LA then NYC and book some TV performances. David Rowe let me know that they are releasing a special 'vinyl' release of RDLS on Record Store Day on April 17th (not the 19th) with another different album cover along with the digital/physical CD release on April 24th, forgot to pass that other bit of info on to you guys. 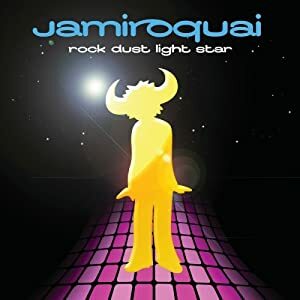 But yeah, in regards to the frets over the 'new album cover', I join the consensus against it, just looks shoddy and not thought through, in a way it just continues the prevailing narrative of Universal Music half-assed treatment of Jamiroquai, from missed pre-announcements to misinformations on basic album releases, but I try not to dwell on these issues and always try to look towards the positive. But in a way the new album cover is ok, but most certainly, I can applaud them for finally releasing this album in the states....but I swear, if RDLS sells gangbusters in the States and they roll out TWOMlike promotions of the new album just to shift some more units then they still haven't won my 'fan respect'. Anyway, will let you all know more soon when I hear it...take care! Cheers! What happened to the other discussion about Jamiroquai not touring in the US? It disappeared! I SWEAR it was in the Funktion Room - now it's gone. So we are being censored. I would think Jamiroquai would understand free speech and allow it. I hope I am looking in the wrong place and they didn't delete it just because they don't like that we complained . . . Put our backs against the wall. Or don't we count at all? LisaTheLisa wrote: What happened to the other discussion about Jamiroquai not touring in the US? It disappeared! I SWEAR it was in the Funktion Room - now it's gone. So we are being censored. I would think Jamiroquai would understand free speech and allow it. I hope I am looking in the wrong place and they didn't delete it just because they don't like that we complained . . . I think that thread was either moved or deleted due to non-activity, but what would I know, I'm not on this forum all the time as my fellow fans. I don't think anyone will be censored since my friend David Rowe runs this forum along with other great fan mods. Cheers! Topics dont´get deleted without a reason.Only if it is spam or offending somebody. If there is no activity they just will move down in the list. what´s the name of the topic?What was it about? If it got deleted per accident when we got rid of hundreds of spam the other day I apologise. The topic "JAMIROQUAI - PLEASE COME TO...!!!" was accidentally deleted the other day in the haze of mass spam deleting. I found it and recovered it. It has been placed in "The Funktion Room". There was talk going on in there about U.S. touring (if that's the thread being spoken about above). Thanks for the info JamiroFan2000......I looked on the emg website and had a view of the cover of the vinyl release.....much better...white brick wall with a painted buffaloman still dripping blue paint...I might just have to get it even though I just purchased the canadian release one.....and I have the cd. omg haha! hilarious! those commies deleted the page! all is forgiven with their release! curse_t_70 wrote: Thanks for the info JamiroFan2000......I looked on the emg website and had a view of the cover of the vinyl release.....much better...white brick wall with a painted buffaloman still dripping blue paint...I might just have to get it even though I just purchased the canadian release one.....and I have the cd. yes, will definitely have to buy! Jamfan (Natalie?) please keep us up on where to buy the vinyl! Isn't this major news.....why wouldn't it be on the home page? And the Americans get in line. Last. Yes, this is major news. If it's real, it should be on the front page! Last edited by Giba7 on Thu Apr 05, 2012 1:39 am, edited 1 time in total. Could you link me to the salespage of the vinyl release on the emg website? I really want to see this cover and pass it on to my fellows on facebook & elsewhere. In regards to why this release hasn't made the frontpage of the official site as big news, David Rowe was caught offguard about this surprise release as I was and promised me he's in the process of putting up a thread here and posting on the news on the Official mainpage & Funkin Site (which has already been posted). Can't wait to see this other cover and great news hunting Curse, much appreciated! Cheers! Fontana Distribution is a subsidiary of Universal Music Group. Executive Music Group is one of Fontana's labels. From Wikipedia: "Fontana Distribution has been known to successfully round up albums worldwide from national Universal Music Group companies for American release"
Will post again soon when I hear/see more! Cheers! hey -I can't find it on the emg website. and Jamirofan, you are Diamond Doc/Dye? I was reading @ Funkin.com. sounds like some Jamiroquai fan has Fontana connections! 17 days into April but no rain, sunshine only. I had the purple "When Doves Cry"
Giba7 wrote: hey -I can't find it on the emg website. no, Dye/Diamond Doc are two other fan friends from JamiroTalk whom alerted me to this release and deserved props for the help. the vinyl cover is on the 'slideshow banner' playing on the main page of the executive music group website, it changes pictures every few seconds, their is a banner in it about the U.S. release of RDLS and has pictures of both album covers, vinyl and CD. Cheers!